Arsene Wenger insists he did not recognise the Mesut Ozil who played for Germany at the World Cup. The reigning world champions endured a humiliating tournament , finishing bottom of a group comprising Mexico, Sweden and South Korea. 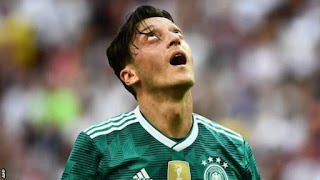 Ozil played in the defeats to Mexico and South Korea, but was left on the bench against Sweden, a game in which Germany recorded their only win in Russia – Toni Kroos’ late goal giving them a 2-1 victory. The Arsenal midfielder was largely anonymous in their final group game, with the Asian nation running out 2-0 winners, and there is now speculation over whether Ozil will play again for his country . The former Real Madrid man, along with team-mate Ilkay Gundogan, attracted criticism before the tournament even started after the duo were pictured with Turkish president Recep Tayyip Erdogan, leading some in Germany to call for his exclusion from the national team. And Wenger believes that the furore around that meeting affected his former player’s mindset. “I know Ozil well, he’s an exceptional football player but him and Gundogan suffered from what happened before the World Cup,” he told beIN SPORTS . “They have been vindicated in Germany when Ozil is a guy who needs support. He doesn’t need controversy. When I watched him play I could feel that there were situations in the game where he could have moved forward, progressed, played more vertically. Ozil will continue his club career under new management, with Unai Emery replacing Wenger at the Arsenal helm before the start of the 2018-19 season. The attacking midfielder scored five times in all competitions last season, and also provided 14 assists.